A Great way to say Welcome to Your New Home! 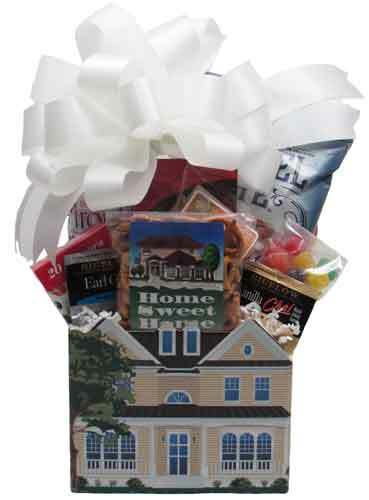 This house container is filled with Ghirardelli Cocoa, “Home Sweet Home” Snack Mix, Spiced Gum Drops, Almonds, Tea Packets, Jelly Belly Jelly Beans, Pretzel Twists (Smoky Barbecue or Salted Caramel), and Chocolate filled Wafer Rolls. Wrapped in crisp clear cellophane and topped off with a handmade bow. Includes a handwritten greeting card. Approximately 15"h x 7"l x 5"w, wrapped for hand delivery. NOTE: This container has been discontinued and we have sold out of what we had on hand.